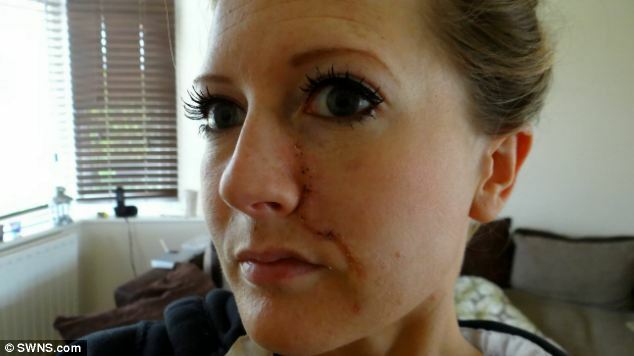 A tanning addict who used a sunbed every day for three years was left with a horrific scar after a massive tumour grew on her face. 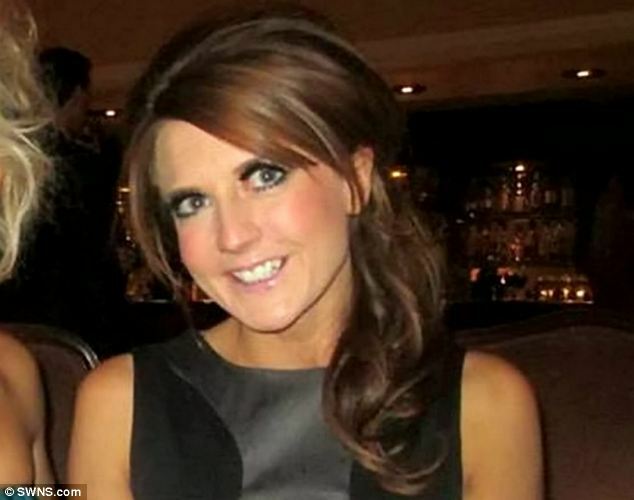 Anna Taylor, 33, spent an hour each night – six nights a week – under the tanning bulbs in her spare room. After more than 900 hours on a sunbed she gave up the habit in favour of fake tan lotion and kept out of the sun to avoid wrinkles. But the damage was already done and in January last year doctors discovered a tiny spot on her face was cancerous. 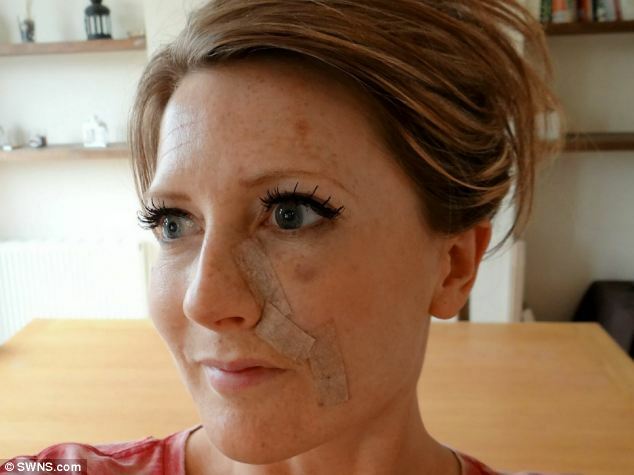 Surgeons were forced to cut a chunk out of her cheek leaving her needing 29 stitches. She now has a huge scar from her eye to her mouth. 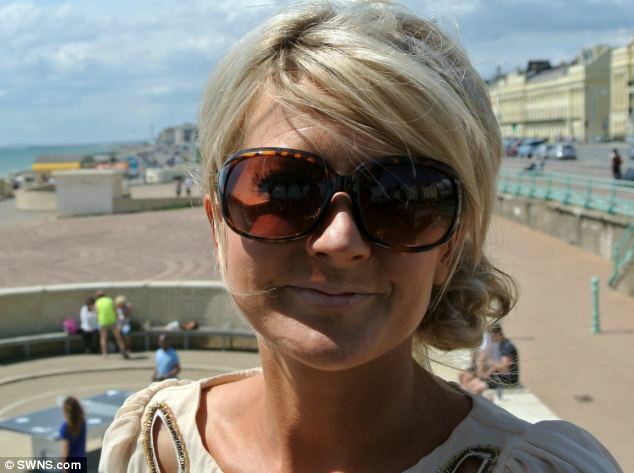 Ms Taylor, from Worthing, West Sussex, said: ‘I was confident about my looks before my surgery. ‘Now, at 33, and with a lifelong scar stretching most of the way down my face, I am reminded daily that my vanity backfired. ‘The scar will fade slightly but I will always be left with a mark. 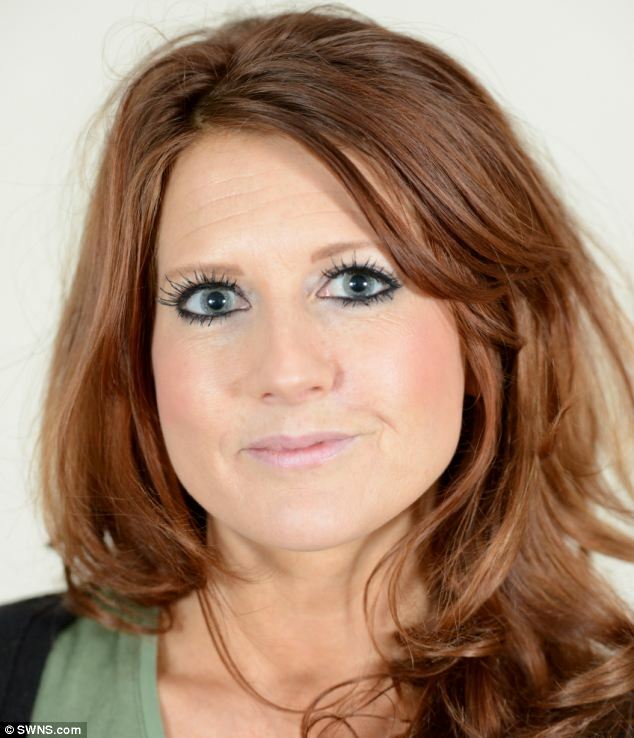 The radio presenter first hired a sunbed for two weeks ahead of a holiday to Ibiza when she was just 18. Basal cell carcinoma is a type of non-melanoma skin cancer. These are skin cancers that develop slowly in the upper layers of the skin. They are more common than melanomas which spread quickly around the body. The first sign of the tumour is usually the appearance of a lump or patch of skin that doesn’t heal. In most cases, cancerous lumps are red and firm while cancerous patches are flat and scaly. Basal cell carcinoma starts in the cells lining the bottom of the epidermis and account for about 75 per cent of skin cancers. The exact cause is unknown but it is thought to be linked to overexposure to UV light. The chance of developing the cancer is higher in people with a family history of the condition, in people with pale skin and in those with lots of freckles. The condition affects about 100,000 new patients in the UK every year. Surgery is the most common treatment. She then spotted one in the classifieds section of her local newspaper for £50 and snapped it up, spending half an hour on each side every night except Sunday. 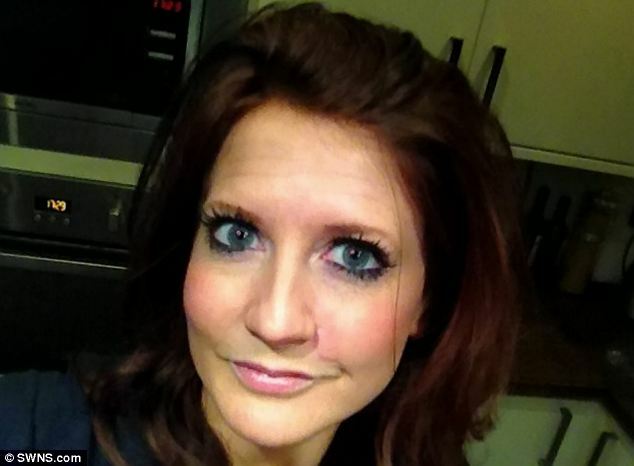 She gave up the sunbed in her early 20s – but unbeknown to her, the damage was already done. 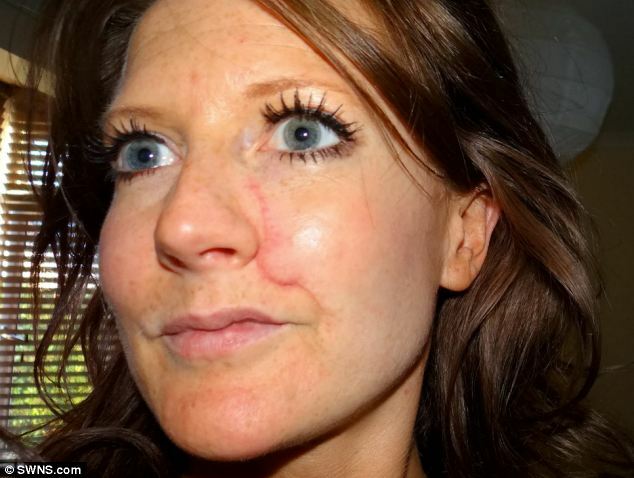 She first noticed a tiny spot on her left cheek near her nose in 2010 but dismissed it after a doctor said it was nothing more than a little scar. But the blemish grew and after two people commented on it she went to see another doctor in January last year. After a quick look with a magnifying glass, he announced it was a skin cancer called basal cell carcinoma – caused by exposure to UV rays. Ms Taylor, who is single, said: ‘I felt sick, absolutely sick. ‘They kept saying to me you must sunbathe, but I don’t – I’m very vain and I don’t like my freckles and I don’t want wrinkles. ‘They kept saying it was very rare for someone my age to have this and that certainly didn’t make me feel any better. ‘It was only when the fifth or sixth person said about the sunbathing that I suddenly remembered about the sunbeds. ‘I loved the feeling of the warmth on my face and it made me feel healthy. Surgeons at Royal Alexandra Hospital in Sussex cut out the tumour – about the size of a 5p – and the surrounding tissue in two 30 minute operations in June. Ms Taylor, who was only under local anaesthetic, said: ‘I could see them there, peering down at me as they cut it away, and I could smell the flesh burning as they stopped the bleeding. ‘It was horrid – really, really horrible. ‘It felt like it was massive on my face and they were just cutting and cutting. ‘There were times when it felt like it was really brutal as they were cutting the roots out and I was left with a lot of bruising. ‘When I finally took a peak under the bandages it was awful. Two days later, surgeons patched up the gaping hole in her face by stretching the surrounding skin. But they had to slice her face from just below her eye to her mouth, to give them enough skin to create a flat scar and avoid puckering. Ms Taylor said: ‘It was horrible. The shallow side of me thought I looked horrible and I’m single and nobody in their right mind is going to want to date someone like that. But Ms Taylor is coming to terms with her scar and wants to persuade tanning addicts to ditch the harmful habit. She said: ‘There is no point and no excuse for going on sunbeds, especially with all the self-tan products out there now. ‘I know first-hand how damaging it can be.